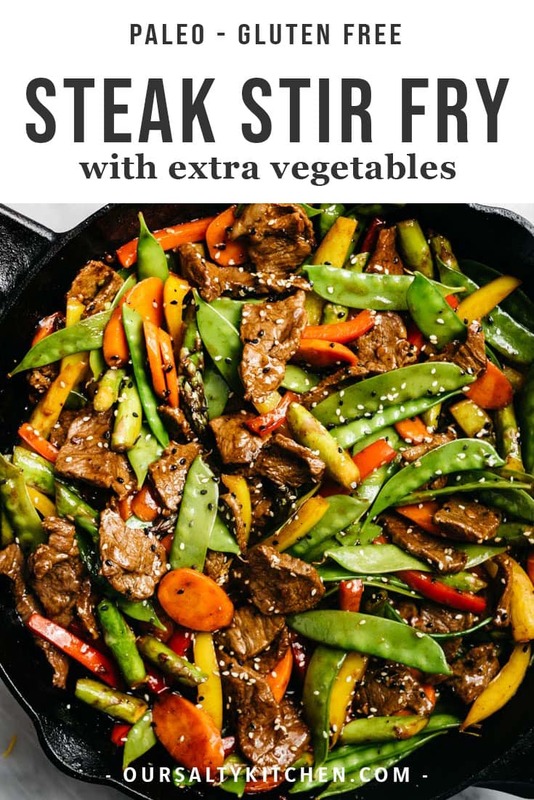 This Mostly Veggie Steak Stir Fry is a weeknight workhorse! 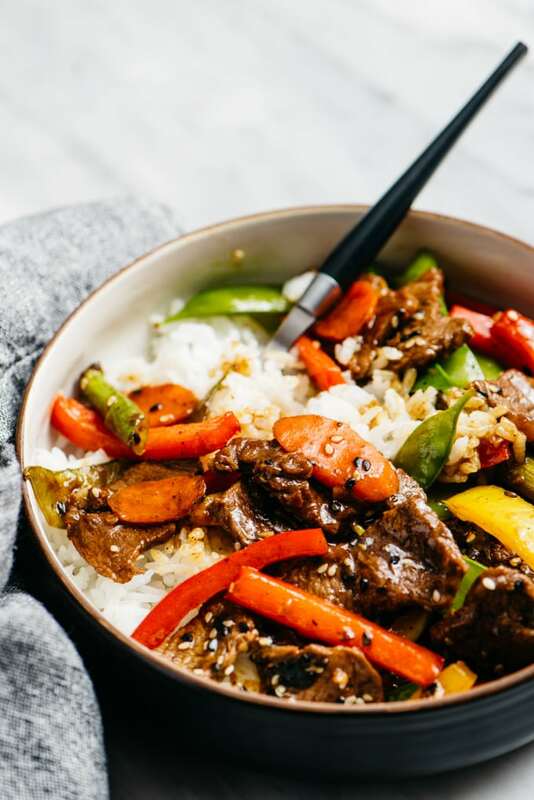 Tender shreds of beef, all of the veggies, and a tangy stir fry sauce come together for an eat-the-rainbow experience you won’t want to quit. Ready in about 30 minutes, this quick and healthy meal is paleo, gluten free, sugar free, and totally irresistible. So you’re me, on a Friday night and you’re craving steak. Mmmm, steak. But you recently saw your doctor for your annual physical and you’re all “I totally eat my veggies doc! I taste that rainbow every day”. A conundrum? No no no my friends – an opportunity. A very delicious, very reasonable opportunity in the form of this Mostly Veggie Steak Stir Fry. We’re talking carrots, asparagus, two kinds of bell peppers, and snow peas. Stir fried until bite-tender, then tossed with tender strips of beef in a bright and tangy sauce with zero sugar. Yes my friends, NO SUGAR in that sauce. But still sweet and delectable and totally irresistible. 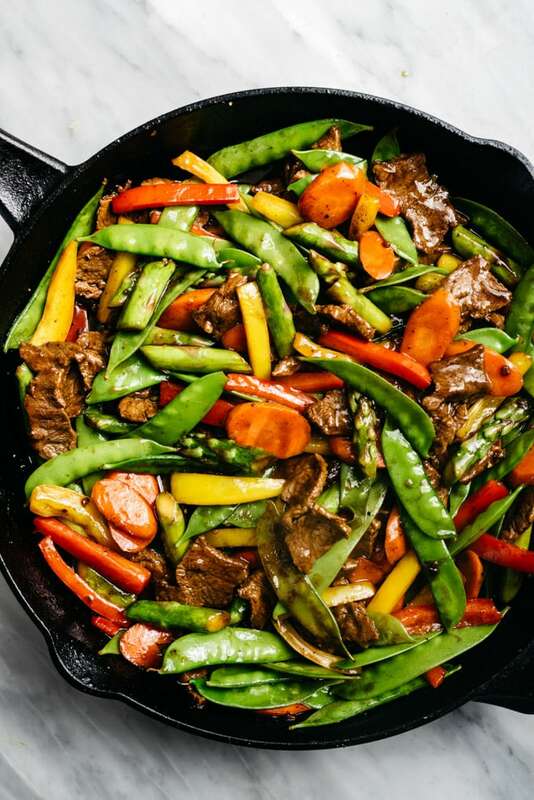 Beef stir fry – veggie style – it’s totally what’s for dinner. 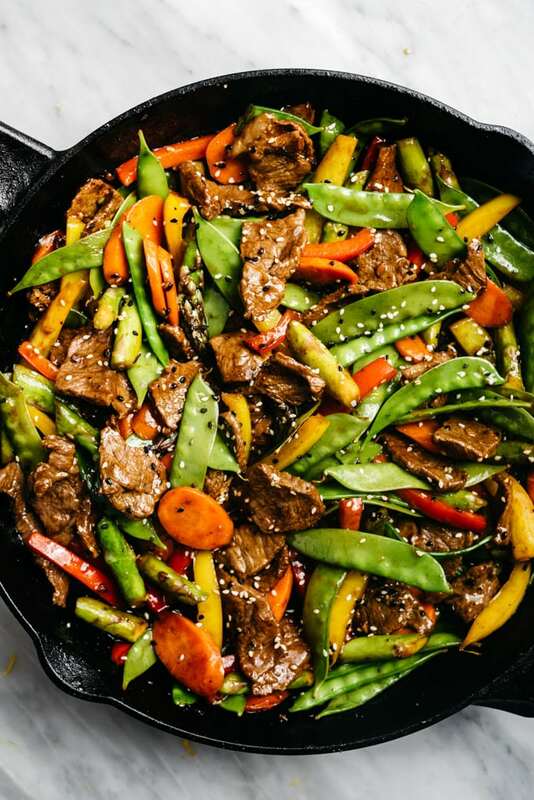 Classic steak stir fry gets a healthy upgrade in this easy weeknight dinner recipe. 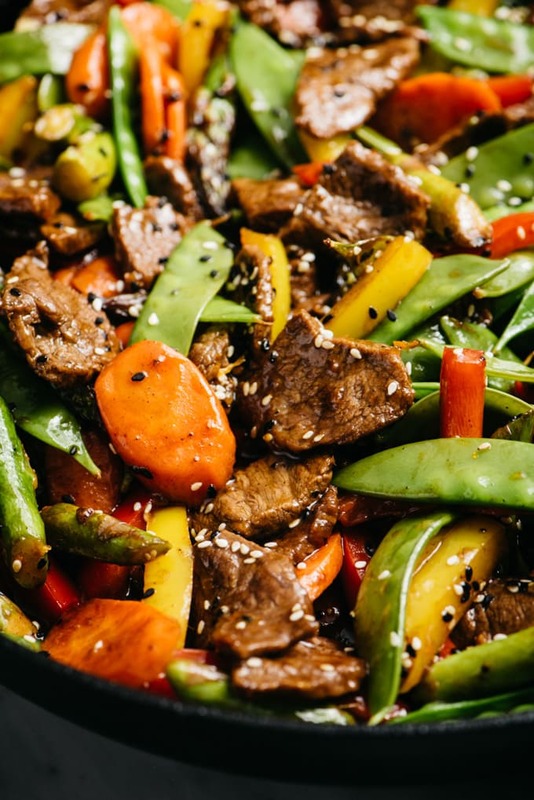 Rainbow veggies are stir-fried until bite tender, then tossed with tender strips of beef in a sugar free, gluten free and paleo friendly sauce that doesn’t sacrifice an ounce of flavor. Make this recipe quicker by using pre-cut stir fry vegetables from the produce aisle, or slice and dice your own in under 15 minutes. For ultra-thin steak and super tender slices of beef, place the steak into the freezer for 30 minutes to firm up, then use a sharp non-serrated knife to slice. 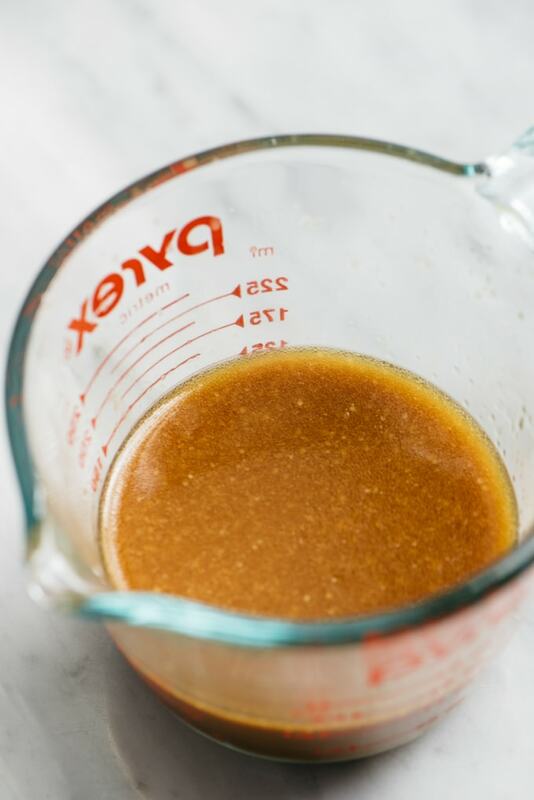 Make the stir fry sauce – coconut aminos, rice vinegar, OJ, honey, sesame oil, and cornstarch or arrowroot powder (for paleo). Whisk it up, give it a sniff (mmmmm), then set it aside. Prep your meat and veggies. Thinly slice a pound of your steak of choice. A few different cuts work here, like sirloin, skirt, or flank. Choose a fairly well-marbled cut (it will have max flavor cooked quickly in a stir fry) and slice thinly against the grain for tenderness. I cut the slices in half to make them more bite-sized. Prep yo veggies! I’m using carrots, asparagus, red and yellow bell pepper, and snow peas. Behold that nutrient-dense rainbow! You can slice the veggies into julienned strips, as above, or into a bite-sized dice. Just try to keep the pieces fairly uniform. Now let’s select a pan. You need a large surface area for best results – you want the meat and veggies to sear, not steam, so use a 12″ skillet or a wok. I’m a cast iron devotee, and it worked beautifully for this stir fry. 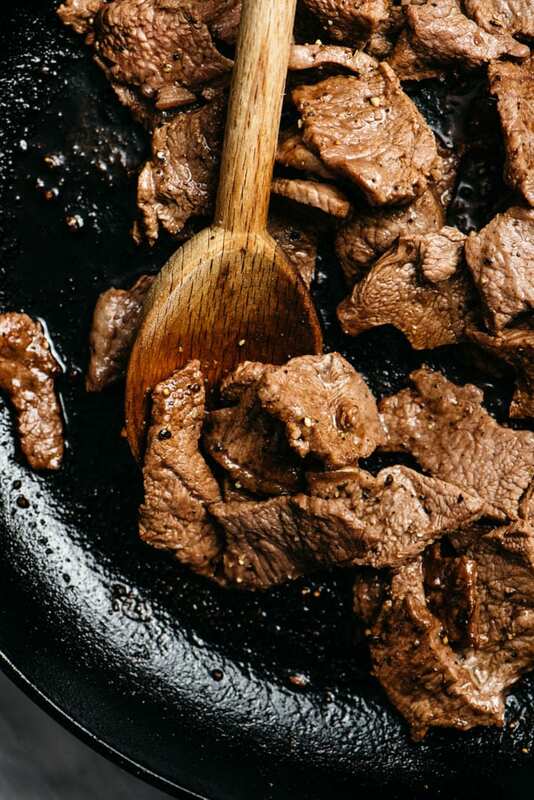 Heat the skillet over high heat, add a splash of olive oil to the pan, then stir fry the steak strips. Add half the steak to the hot oil, season with salt and pepper, and saute until no longer pink. Remove the cooked steak using tongs, set aside, then repeat with the remaining batch. Add another splash of olive oil to the skillet, let it heat up, then add some minced garlic. 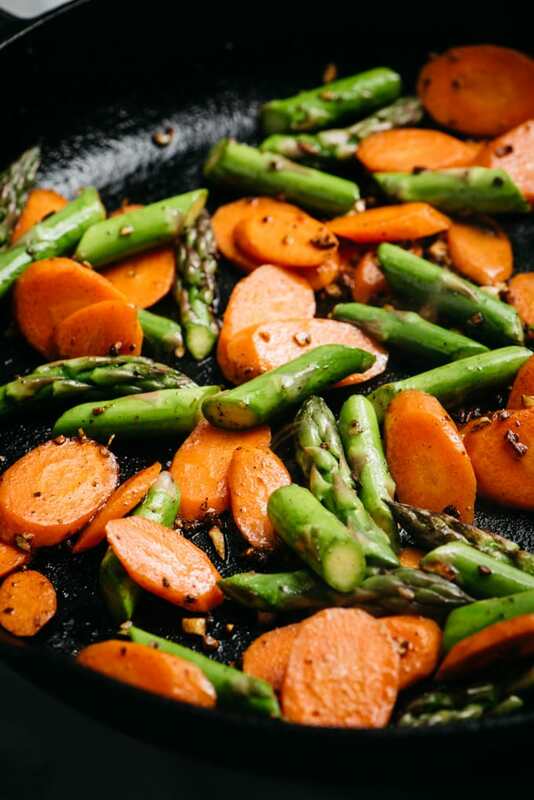 Sautee for just a minute, then add the carrots and asparagus and season with salt and pepper. These veggies are heartier than the rest and they need a bit of a head start. Sautee for 3 minutes until the carrots are just starting to brown around the edges. Add the bell peppers and snow peas to the pan, and again season with a bit of salt and pepper. Give ’em a good toss to coat them in the cooking oil and sautee for an additional 3 minutes. Stir frequently to keep things moving. Add the steak back to the pan, then pour in the stir fry sauce. Sautee and stir frequently until the sauce thickens and the vegetables are cooked to bite-tender – about 3 more minutes. Toss in some sesame seeds, and you’re done! I served this over white rice because YUM, but it’s also really filling as-is. You can also serve over cauliflower rice for a 100% paleo and/or grain free experience, or toss in some cooked sweet potato glass noodles or rice noodles with the stir fry sauce. 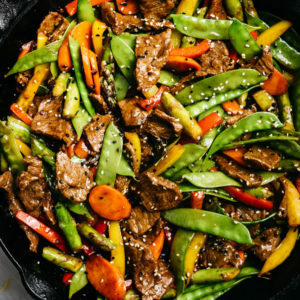 What is the best steak for stir fry? You want to select a tender well-marbled cut that cooks quickly. Sirloin, flank steak, and skirt steak are each great options. Why should I cut the steak into strips and not cubes? For one, it cooks faster. For two, thinly sliced steak cut against the grain is incredibly tender. To make the slicing a little easier, place the steak into the freezer for 30 minutes to firm it up. To cut against the grain means you’re cutting perpendicular to the fibers of the meat. What are the best vegetables for stir fry? Quick cooking vegetables that taste awesome while still bite tender work best here. In addition to or in place of thinly sliced carrots, asparagus, bell peppers, and snow peas, you can can also consider broccoli (add with the carrots and asparagus); or red cabbage, bean sprouts, zucchini, or yellow squash (add with the peppers and peas). 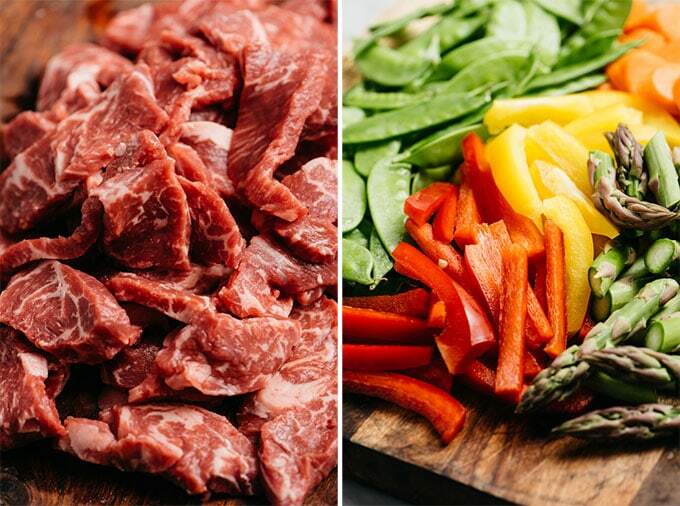 How do I store steak stir fry leftovers? This recipe keeps in the fridge for up to 4 days in a tightly sealed container. You can reheat in the microwave (good) or quickly pan sear until hot (best). I thought it was better the second day! I don’t recommend freezing this recipe. 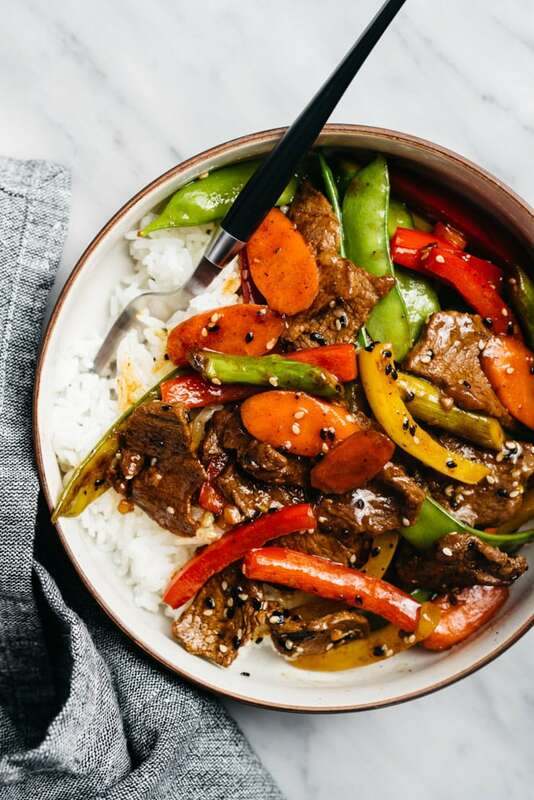 Classic steak stir fry gets a healthy upgrade in this easy weeknight dinner recipe. 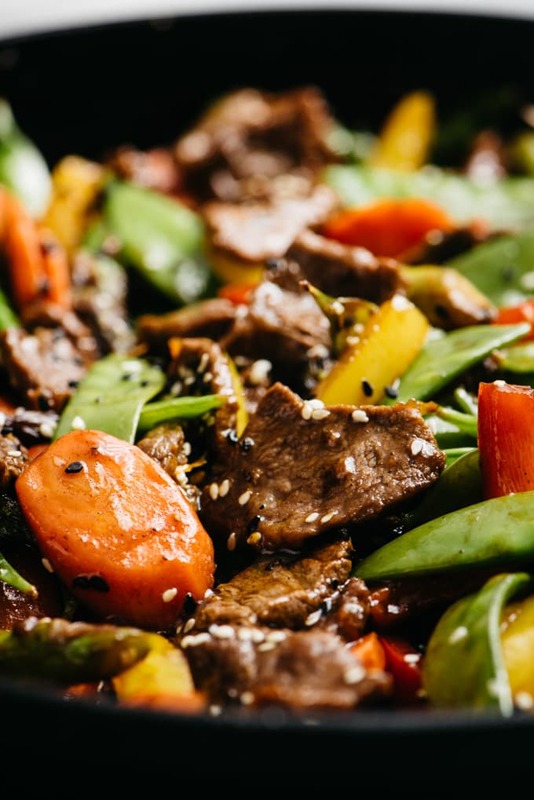 Rainbow veggies are stir-fried until bite tender, then tossed with tender strips of beef in a sugar free, gluten free and paleo friendly sauce that doesn't sacrifice an ounce of flavor. Place the steak in the freezer for 30 minutes. Remove from the freezer and slice thinly against the grain, 1/8" - 1/4" thick. While the steak is freezing, prepare the vegetables and stir fry sauce. Combine all stir fry sauce ingredients in a bowl. Whisk until combined and set aside. Heat a 12" cast iron skillet over medium heat. Add half the olive oil. Add half the steak to the skillet, season with salt and pepper, and stir fry until charred and medium rare, 3-4 minutes. Remove the steak with tongs, set aside onto a plate, and repeat with the remaining steak strips. Remove all steak from the skillet once browned. Add the second tablespoon olive oil to the skillet and allow to heat until shimmering. Add the garlic and sautee 1 minute. Add the carrots and asparagus and sautee 3 minutes, stirring frequently. 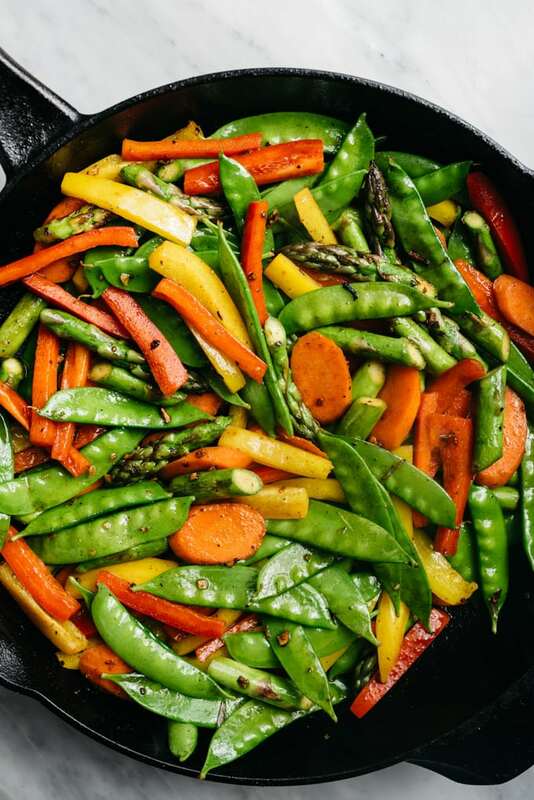 Add the bell pepper and snap peas, toss with the asparagus and carrots, and stir fry all vegetables an additional 3 minutes. Be sure to stir and toss frequently. Add the steak back to the skillet along with the stir fry sauce (give it another whisk before pouring in if the cornstarch/arrowroot has settled to the bottom). Stir fry, stirring frequently, until the sauce thickens and the vegetables are bite tender, 3 minutes. Remove from heat, stir in the sesame seeds, and serve immediately. Leftovers can be stored in the fridge in a tightly sealed container for up to 4 days.